On Episode 5 there are a lot of callbacks to a simpler time in the series. While Laurel and Thea are out doing something stupid, Diggle, Felicity, and Oliver are left defending the city from the Ghosts. Felicity is enjoying the three O.Gs. (Original Gangstas… her words, not mine) of team Arrow handling a mission like old times but Diggle is still reluctant to put his personal beef with Oliver behind him. Diggle actually manages to catch one of the Ghosts, but he was able to escape into the night. Nissa and Malcolm Merlyn are sparring… well, kind of. Malcolm is sparring, but it’s pretty clear that Nissa wouldn’t hesitate to kill him given the chance. We all know by know how Nissa loves to hold a grudge. She manages to nick Malcolm with her blade one good time, but he quickly repairs himself using the Lazarus Pit nearby. In walk Thea and Laurel with a request. Thea wants Malcolm to bring Sara back to life, but he refuses. What Laurel is asking for is a miracle and Malcolm firmly denies her request. Even Nissa thinks using the Lazarus Pit to bring her late girlfriend back to life is a bad idea. Back at the Arrow Cave, Diggle and Ollie present Felicity with their first lead in the case of the Ghosts. While Felicity is running the DNA off the tooth false tooth Diggle removed from the escaped Ghost, she suggests that the O.Gs. go out to celebrate their small victory over margaritas. Once again Diggle declines. At this point, Oliver is done waiting for Diggle to accept his peace offerings. 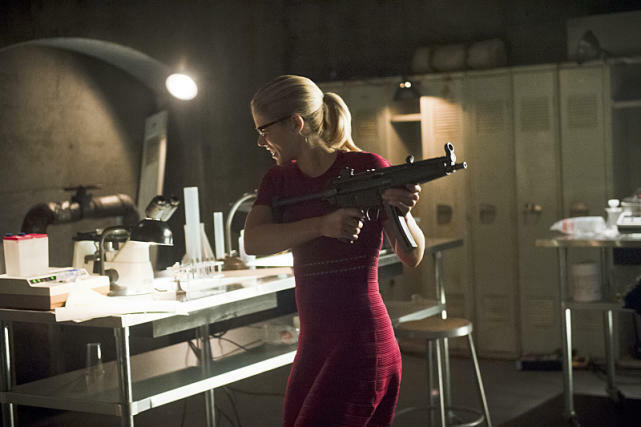 Diggle walks into his home and immediately draws his gun. Lyla and baby Sara are nowhere to be found, but there is a random man standing in the living room. He’s a member of Argus with information on the person who ordered the hit on Diggle’s brother years ago. Her name is Mina Fayad and she happens to be in Star City for the time being. Damien Darhk meets with Mina and a heavily tattooed individual. Mina tells Darhk that she has been ordered by the leaders of HIVE to take steps in assisting with the vigilante problem in Star City. That tattooed guy, Double Down, is supposed to be the solution to that problem. Darhk brings out the Ghost that escaped from Team Arrow at the beginning of the episode. Annoyed that the Ghost didn’t follow by killing himself instead of escaping, Darhk orders the new guy to demonstrate his problem-solving abilities by disposing of the now unemployed Ghost. This is where it gets weird. Double Down grabs a few of his tattoos off his skin in the form of playing cards and throws them at the Ghost, piercing his chest. The Ghost is killed and Darhk is very impressed. The theme of this episode is everyone will tell Laurel not to do what we know she will ultimately do despite their warnings. This particular time, Nissa is the one warning Laurel that if Sara comes back she will not be the same person she was before she died. After running the DNA on the Ghost tooth, Felicity is just as confused as ever. Oliver decides to assist the SCPD with a robbery while Diggle is out on the hunt for Mina Fayad. The robbery Oliver was pursuing turns out to be a trap set by Mina Fiyad. Double Down attacks Oliver and the two battle it out until the card-throwing villain manages to get the better of him and escape into the night. Thea is concerned about the side-effects from the Lazarus Pit. Malcolm tells her the pit contains the souls of all the people who have bathed in its waters. Thea is experiencing blood-lust and the only way to quench her thirst is to kill people. That’s some interesting fatherly advice. Malcom also tells Thea about a sage with healing powers that may be able to help her. Felicity extracts one of the dagger-like playing cards from Oliver’s arm and reveals that Double Down is a metahuman from Central City. Then she proceeds to scold Diggle and Oliver for going out on their own to catch bad guys because they were both too stubborn to ask each other for assistance. She leaves the two to figure out their issues while she takes the playing card to Palmer Tech to find out the secret behind the playing card tattoos. Oliver and Diggle have yet another “lover’s quarrel”. Diggle tells Oliver he lost his trust, but Oliver just wants a chance to win it back. The two eventually realize that they have a common enemy in Mina Fiyad and head off to pursue her. At Palmer Tech, Felicity tasks Curtis Holt with finding out exactly how Double Down’s metahuman ability to pull deadly playing cards from the tattoos in his arms actually works. Remember back in Season 1 when Oliver would bring tasks like this to Felicity when she was simply an IT person for his family’s company. We’ve come such a long way since then. Damien Darhk is not pleased with the failed attempt to stop Oliver Queen. He displays some of his mystical powers while by killing Mina Fiyad in front of Double Down. This was his way of warning the as assassin that he will not tolerate failure. Meanwhile, Thea finds out that there is no Sage and no cure for her side-effects from the Lazarus. The only way to get her urges of blood-lust to subside is by killing. She rebels against her natural desire to kill people. Rebellious Thea is soooo Season 1 but it’s not too bad in this moment. Malcolm tells her that if it makes her feel any better about having murderous desires, he would be willing to resurrect Sara using the Lazarus Pit. When Diggle and Oliver finally catch up to Mina Fiyad it’s too late. The pair officially buries the hatchet and team up once again. At Palmer Tech, Double Down has tracked down Felicity and Curtis and wants them to reveal the location of The Green Arrow. He pursues the two down into the Arrow Cave. On the way, Felicity is forced to explain to Curtis that she actually works with the Green Arrow. Felicity tries her best to fend off the attacks of Double Down with the weapons in the Arrow Cave, eventually causing him to retreat. Oliver, Diggle, and Felicity use the DNA from the stray playing card to track down the fugitive metahuman. He’s attempting to get back to Central City via the train connecting the two cities. The ceremony to resurrect Sara is beginning. Nissa makes one last effort to reason with Laurel but she in true Laurel fashion she stubbornly ignores her warnings. They lower Sara into the Lazarus Pit and moments later Sara arises. The guards are forced to subdue Sara who is very erratically trying to escape. Diggle and Ollie confront Double Down. The metahuman aims a deadly playing card at Diggle, but Oliver takes the hit for his friend. Diggle easily defeats double down and it seems as though he and Ollie are officially back on good terms. The O.Gs. toast to OTA (Original. Team. Arrow) over drinks. I prefer O.Gs. but I’m ok with OTA. Now that Double Down has been captured the team needs to consider a new Arrow Cave especially because he could’ve alerted Darhk about the current locale. Back at Nanda Parbat, Sara is like a wild animal since her resurrection. Seeing what the Lazarus Pit has done to Sara has left Nissa no choice but to destroy the pit so that it will never be used again. At Lian Yu, Oliver is playing the role of undercover bad guy. Baron has been leading the production of Slam, a drug that is like a hybrid between cocaine and heroin. Oliver has to figure out a way to thwart Baron’s operation to save the people on the island and stop the possible distribution of the Slam.